Photo View Postcard. Multi. Cardstock. 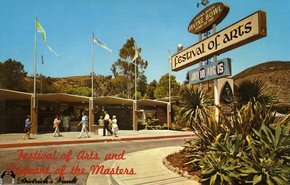 This glossy, full-color, photo card is titled, "Festival of Arts, and Pageant of the Masters, Laguna Beach, California." It is marked, Photo by Geo. E. Watson, with logo, SceniKrome" From Golden West, 700 W. Willow St., Long Beach, Calif. 90806 Made by H. S. Crocker Co., Inc., San Francisco Calif. 94103. Unused.